This is the last post of 6 about a c. 1820 18' x 36' wing on a Jackson, NY, farm house. I assume the reader has read the earlier posts. 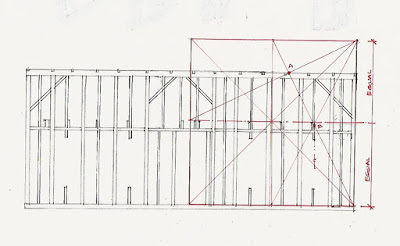 A measured frame is always, for me, an opportunity to learn how Practical Geometry was used. 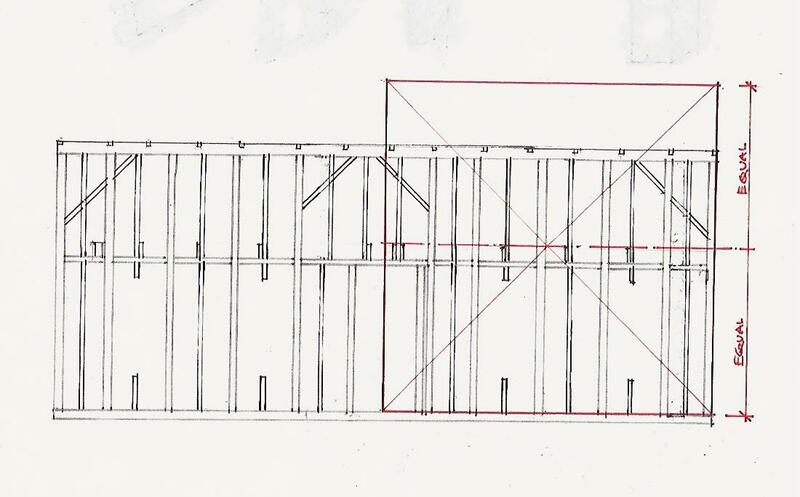 Here is the framing for the west side of the wing. 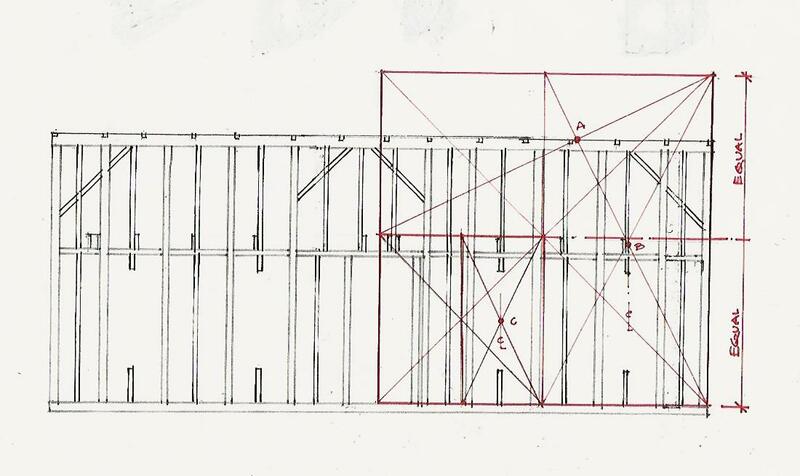 The basic geometry for the building is 2 squares, each 18 ft x 18 ft. 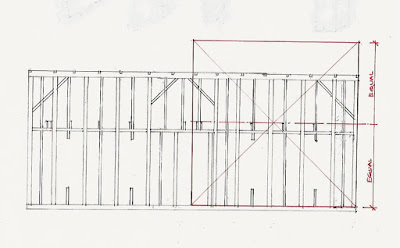 The floor plan is 18 ft wide by 36 ft long. 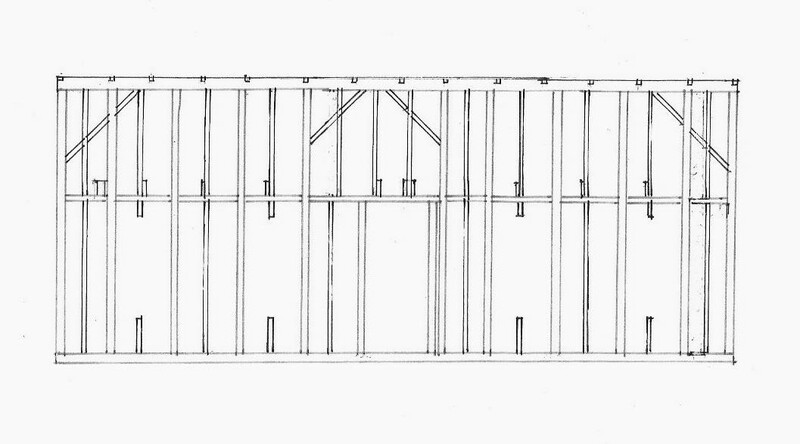 The framing elevation is also 2 squares 18 ft x 18 ft. I show only the right half. The 2nd floor height is half the height of the square - 9 ft. The Rule of Thirds lines cross at A the height of the wall. The lines also cross at B the center line of the window farthest to the right. I have not drawn all the lines for the Rule of Thirds star. They run from all the corners to all the centers of the sides of the square. The larger square can be divided into 4 smaller squares. One is outlined on the lower left. 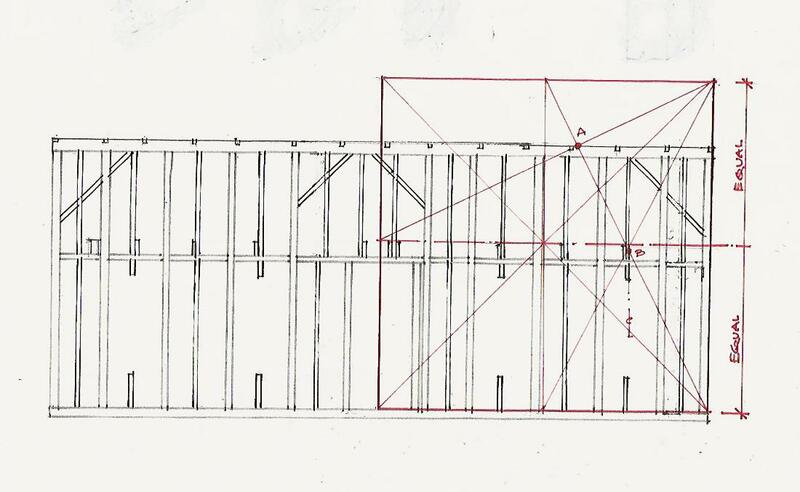 The window next to the door is located at the center of the right half the lower left square - at C.
The sheathing boards are cut by a sash saw. The house was framed 'pre-circular saw' which seems to be c. 1830. 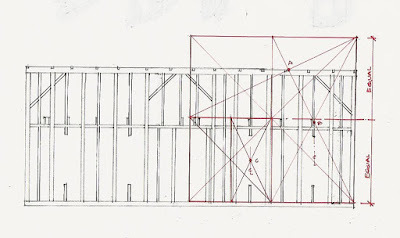 The mortise and tendon frame is augmented by nailed framing members. The frame itself is cut, not hewn. Nails begin to be manufactured in the early 1800's and come into general use by 1820. There is both a Rumford fireplace and space provided for a cast iron stove, especially the framing for the chimney which begins on the 2nd fl. Cast iron stoves began to be manufactured c. 1820. Rumford fireplaces were still being built. The brick used for the fireplace, the chimneys and the nogging is soft and water struck, still baked in a kiln fired by charcoal. For pictures of these details please see the earlier posts in this series. The top plate of the frame has unusual bird's mouth - the joint which seats the rafter on the plate. Here is a quiet piece of craft known only to the carpenters until the frame was uncovered. As the corner boards were removed from the house the boards looked worn out, rotted, junk. 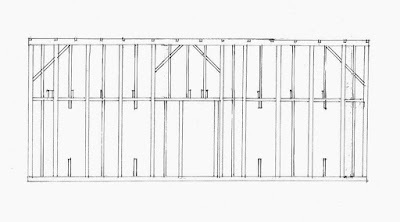 The framers disconnected the boards and saw how carefully shaped and pieced the boards were, not only as a graceful edge, but to resist rain and wind. This particular corner detail was also used by the Shakers locally in Lebanon, NY, and in Harvard, MA. 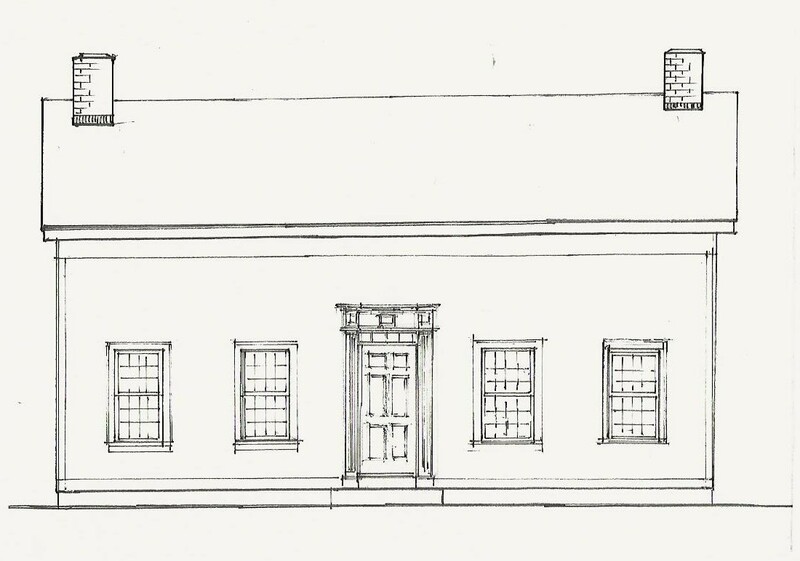 It was also used on the 1837 house of Elizabeth Cady Stanton in Seneca Falls, NY. I keep this section in my office . The frieze board and its molding comes to the eave return and curls into a point at the intersection of the walls. This was my first view of this house. 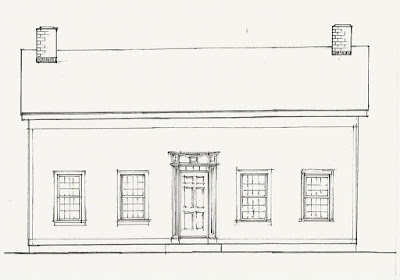 Below is what it looked like in 1820. The link to the men who took down and repaired this house, Green Mountain Timber Frames: https://www.greenmountaintimberframes.com .